A2Central.com - Your total source for Apple II computing. This month on Open Apple, we bring you the traditional big group podcast that we record every year at KansasFest. Tune in for a casual chat with your favorite retro podcasters, and get a behind-the-scenes peek at what makes KansasFest special. The excellent Apple VHS Archive YouTube channel continues to unearth analog video gold. The latest update is a nine and a half minute company internal video featuring, among others, a beardless(!) Woz – by then an “Apple Fellow” – talking up the benefits and general warm fuzzies of hardware and software patents. Watching Apple patent attorney Bob Martin literally smashing unlicensed Apple II clones on the floor at about the 4:00 minute-mark is not to be missed! Graffidisk is a new kind of software for the Apple II. Its limit is your imagination: enter text or draw a GR picture on your Apple II and let Graffidisk tag your 5.25″ floppy disks. See the results of your piece of art with John Morris’ Applesauce. Share with your friends! This Apple-1 was acquired from Adam Schoolsky, a friend of Apple founders Steve Jobs and Steve Wozniak, for $3,500 in 1994 by David Larson, a former professor at Virginia Tech. Gets your wallets out and take out that second mortgage now, as bidding begins on September 25. Read RR Auction’s listing here. Software updates! Windows-based emulator AppleWin, and Dennis Molony’s Apple II Disk Browser saw new versions recently released (hat tip to Call APPLE for those items). Michael Packard has officially announced OidZone for Apple II-family computers. Thomas Harte’s MIT-licensed emulator Clock Signal now emulates the IIe. Jeff Ramsey invites you to play his server-based Zork I setup on your Apple II. Just telnet over to zork.retroadventures.net, port 6502 and login with the username zork and password 2018Zork. Did you get on the waitlist for one of John Morris’s Applesauce devices? VCF West 2018 happened this weekend. Hackaday has some great coverage. … and I’m sure plenty more 8-bit Apple IIish goodness happened elsewhere, but that’s all I have time for right now. See you soon! Update: IIGS developer Ewen Wannop reached out to us and let us know the item mentioning the update work on SNAP was inaccurate. We have removed the paragraph and apologize sincerely to Ewen and our readers for the error. Juiced.GS, the world's last and longest-running Apple II print publication, will publish its two-dozenth volume (issues #93–96) in 2019. Apple II enthusiasts who are curious about Juiced.GS can subscribe to the email newsletter to receive a new, free sample issue with 20 pages of content from the past five years of the magazine. BBS: Here's everything you need to know about connecting to a telnet bulletin board system or even running your own, as well as a review of the WiModem232. It also includes a review of BBS: The Documentary and an interview with its creator, Jason Scott. Education: The Apple II gained much of its fame in the classroom, where its effects can still be felt. This PDF is a reflection on the Apple II's longevity in the classroom and how modern students respond to such classics as The Oregon Trail and VisiCalc, as well as how the Raspberry Pi might serve as a modern equivalent for teaching programming. Raspberry Pi: This affordable microcomputer makes an excellent Apple II peripheral. 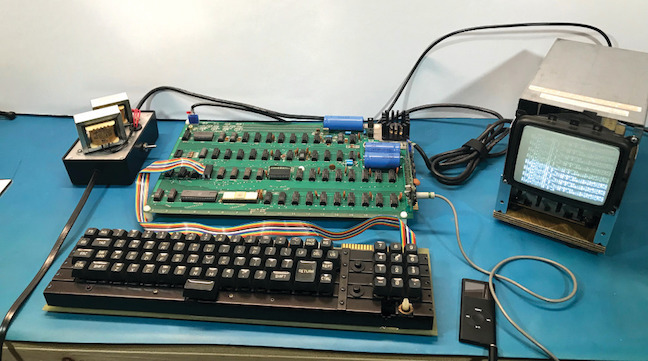 An introduction to A2SERVER, a review of the Apple II Pi, how to use the Pi to run a BBS, and what today's students could learn from the Pi round out this PDF. Apple-1: The precursor to the Apple II, the Apple-1 is also alive and well. From replica models to soldering experiences to convention appearances, the Apple-1 is everywhere in this Concentrate. The Oregon Trail: The seminal edutainment title has seen multiple adaptations over the years. This PDF reviews a theatrical play, a handheld game, and a card game; examines how today's students interpret Oregon Trail; and also goes behind the scenes of Melissa Barron's hack, 73H 0r3g0n 7r41L. These files are available immediately starting at $5, with more PDFs to come later in 2018. After many years of service as the editor of a2central.com, Sean Fahey has stepped aside. Eric Shepherd, the founder of a2central.com, has resumed ownership of the site, and has selected a new editor-in-chief. Our new editor is a well-known blogger, writer, and pundit with his finger on the pulse of the Apple II community. With great pleasure, we announce that effective today, A2Central’s new editor is Mike Maginnis! We hope that going forward we can make real headway toward enhancing A2Central’s relevance and toward making the site better than ever! With that, I turn the reins over to Mike! Enjoy! A new version of Marinetti, the implementation of TCP/IP for the Apple IIgs, is now publicly available. The previous public announcement of a release of Marinetti was 3.0b3 in 2006. Since then there have been several bug fix versions that have not been made widely available. In 2014, the then-latest build, 3.0b8, was made available to Uthernet owners. That version included some debug code that was left in the build to assist with bug reporting. This latest release removes that debug code to improve performance. There are no other functional changes. While this software is still officially classed as ‘beta’ software, it has been extensively tested. It is highly recommended that existing users of 3.0b3 and 3.0b8 upgrade to this version. Marinetti 3.0b9 can be downloaded from the Marinetti homepage, or the a2RetroSystems website where it is available as a disk image that can be mounted in an emulator or a disk emulation device like the CFFA. The disk image includes the original Marinetti 3.0b1 installer for new installations if necessary and a replacement Init which contains the latest changes. Ewen Wannop’s latest Uthernet link layers are also provided. Marinetti was originally written by Richard Bennett in 1996 and was subsequently released as an open-source project. It is now maintained by members of the Marinetti Open Source Project, which is hosted on SourceForge.